The ForexNoki MT4 EA is a forex expert advisor. The Forex Noki automated forex trading software for the MetaTrader platform has been forward tested by Forex Peace Army. 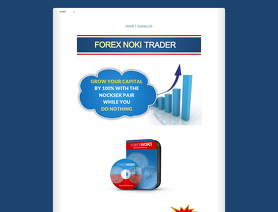 The ForexNoki.com forex robot trades on exotic pair NOKSEK. I run at vendor suggested broker ICM, it slowly adding trades, it has fixed profit per trade. I key is not overtrade, otherwise you can have scary drawodnw, good EA on on a unique pair but not all brokers offer this pair. I set up Fx Noki couple of months ago at my Pepper account, almost it trades everyday.It has 13 open positions but my drawdown remain under 15%. Vendor suggest $500 to start with 0.01 but I think $1,000 is more appropriate in case if NOK get strength. Set up is simple you just need to attach and go and let Noki do its job.